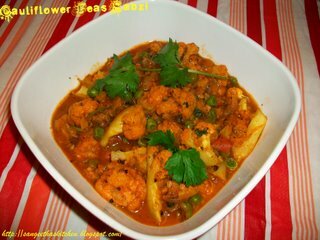 Cut the cauliflower in to small florets n wash thoroughly ,drain n keep aside. Heat oil in a wok/pan, add mustard n fennel seeds wait till splutter and add finely chopped onions and saute for 1 minute and add 1/2 tsp of APF and saute with onion nicely till onion turns soft n pink. Then add chopped tomatoes and saute till it turn soft n mushy. 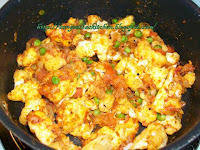 After that add cauliflower florets n peas and fry for 1 minute and then add all dry powder and stir fry for 1-2 minutes. Now add enough salt n water(to the desired consistency) stir well and cook covered in medium heat till cauliflower gets 3/4th cooked. That's all quick n delicious Cauliflower Peas Sabzi is ready to serve. Looks simple and easy.. Will try soon.. The only thing I can think of looking at this is comforting soul- food! 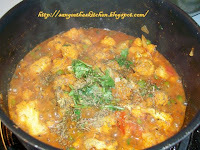 Yummy curry...will go nicely with hot rottis!!! 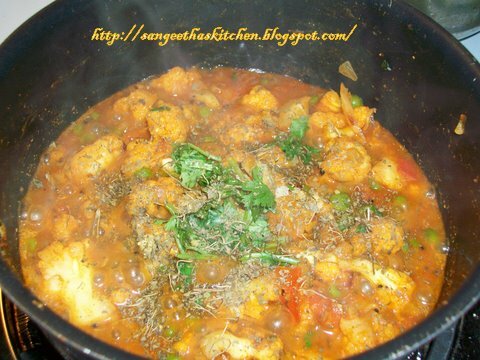 simple and lovely curry, love the combo.. I'll take this for perfect side of chapathi.. Lovely.. 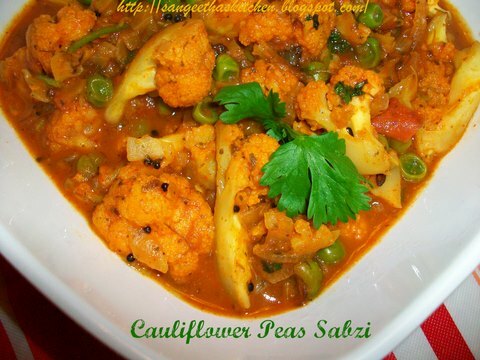 Delicious combo of veggies !! love to have with chapati's !! Sounds so simple ,easy one.. will love to make this when in a hurry.. Nice Colors..